especially children deprived of the necessary means to free them from the bonds of poverty." 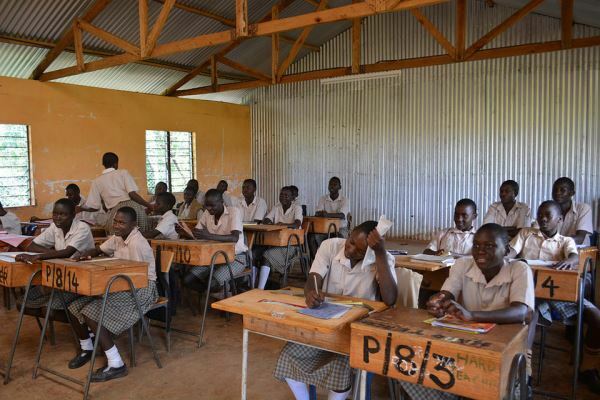 Our Lady of Grace School was founded in 2008 in response to widespread political unrest and tribal violence in western Kenya. The turmoil in Kisumu - an area already plagued by a high rate of HIV/AIDS - made it unsafe for unescorted children to walk to their schools. Through the grace of God and intense effort, Fr. Martin Martiny O.P., established a residential school for these at-risk children, dedicated to Our Lady of Grace. Its mission: to provide threatened and abandoned children with a secure home and an education worthy of their dignity as children of God. Between 2008 and 2015, the impossible happened. Our Lady of Grace grew from fewer than 100 to more than 320 students, and from a single secondary school campus to both a primary and secondary school. In 2016 the very difficult decision was made to close the secondary school due to increased costs and lack of essential funding. Partners in Mission, partnering with the OLG Administration, made the commitment to find good schools for all of the students enrolled in OLG's secondary grades and to fund their education through graduation. This decision allowed Our Lady of Grace and Partners in Mission to fully focus on and fund the primary school. Today, Our Lady of Grace Primary School is recognized in western Kenya for the academic achievement of its students, its devoted faculty and staff, and its commitment to Catholic teachings and values. More importantly, the School continues to be the saving grace in the lives of hundreds of vulnerable and at-risk Kenyan children. Why does Our Lady of Grace need your help? Start-up funding for Our Lady of Grace came not from the Dominican Friars in East Africa, nor the Dominican Province in New York, but from the founder's network of personal contacts in North America. The generosity of those donors sustained Our Lady of Grace School until the School's founder was reassigned to the United States in October 2014. Since then, however, the School has teetered on the verge of financial collapse. The Dominicans - who support three religious communities in East Africa - were simply unable to assume additional responsibility for the School's financial demands. In 2014, they considered closing the School, but another solution presented itself. That solution was Partners in Mission: Our Lady of Grace School Development Fund. I am sixteen years old and am in form two (equivalent to 11th grade in US education system). My grades are excellent. After 8th grade I passed with honors that qualified me to attend one of the top National Schools – Wow, what an honor…except I had no funds to go on to any school. Then OLG invited me to continue my education. I love this school. We are treated with dignity and respect. Our principal is a good role model and our administrator understands all our struggles. I don’t regret having not joined the National school. We are taught so well here. I want to thank all the friends of OLG and Partners in Mission for helping us in education. We will not let you down. God Bless.